We are Alaska's premiere full-service grip and lighting shop. 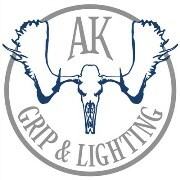 AK Grip & Lighting offers the largest inventory of lighting and grip equipment in the state of Alaska. From feature film production to smaller independent projects, we can get you what you need and do it within the scope of your budget. Our knowledgeable staff is eager to help. "Who's your daddy? The BABYMAX M18 has arrived. Introducing the M18, first offspring of the award-winning ARRIMAX 18/12K. Based on the design principles of the ARRIMAX, the new M18 is an innovative lamphead that works with a new power class of lamp: the 1800W SE HMI. This lamp boasts 750 hours of average life and a Luminous Efficacy of 92 Lumens per Watt (L/W). The Color Rendering Index (Ra) is greater than 90 at 6000K (CCT). Now the "Brightest HMI you can plug into the wall," the M18 is a lensless, open face lighting fixture that combines the desired light distribution from the optics of a PAR and a Fresnel fixture. The unique ARRIMAX reflector design creates diverging rays to produce a crisp shadow. With a beam angle (HPA) of 20 to 60 degrees and a wide usable field angle, the M18 is designed to be both intense and efficient." 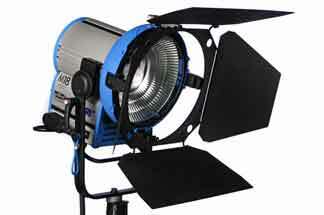 AK Grip & Lighting has just added two BABYMAX M18 instruments to the inventory. See what ARRI's award-winning design is all about. You'll be amazed at the output and portability. Available with the optional medium Chimera and speed-ring!